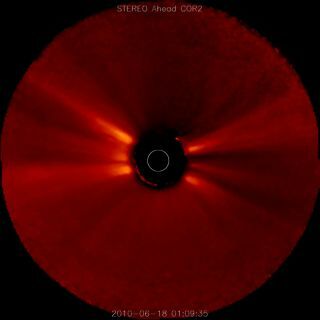 mage of the sun's corona, taken by NASA's STEREO Ahead spacecraft on June 8, 2010. The solar surface is blocked out in this view. New observations from a NASA spacecraft could help solve a persistent mystery — why the sun's atmosphere is so much hotter than its surface. While the sun's visible surface is about 10,000 degrees Fahrenheit (5,538 degrees Celsius), its upper atmosphere, known as the corona, has temperatures in the millions of degrees. NASA's Interface Region Imaging Spectrograph (IRIS) spacecraft looks at the transition region between the sun's surface and the corona. The satellite recently saw evidence of "heat bombs," which occur when magnetic fields cross in the corona and realign, much like the process that causes solar flares. "Because IRIS can resolve the transition region 10 times better than previous instruments, we were able to see hot material rushing up and down magnetic fields in the low corona," Paola Testa, an astrophysicist at the Harvard-Smithsonian Center for Astrophysics who led the research, said in a NASA statement. "This is compatible with models from the University of Oslo, in which magnetic reconnection sets off heat bombs in the corona." This isn't the only way that the corona is heated, but it's one of the contributors. Another factor is when plasma waves from the sun smash into the corona, moving energy into the outer atmosphere. IRIS, which launched in June 2013, could be a step toward understanding coronal heating, which has puzzled astronomers for decades, NASA officials said. One benefit of the observatory is that it looks continuously at the sun, allowing scientists to see quick-moving events such as the heat bombs. "The problem of coronal heating was first discovered in the 1940s," Bart De Pontieu, a solar physicist at the Lockheed Martin Solar & Astrophysics Laboratory, said in the same statement. "The problem involves a variety of complex physical processes that are difficult to directly measure or capture in theoretical models."